For the crust: Combine Cocoa Puff™ crumbs, sprinkles, and 2 tablespoons sugar in a large bowl. Whisk until thoroughly combined and sprinkles are evenly dispersed. Then pour in the butter and mix until all the crumbs are moistened. Pour crumbs into an 8 or 9-inch springform pan; press tightly and evenly into the bottom and up the sides of the springform pan. Set aside. 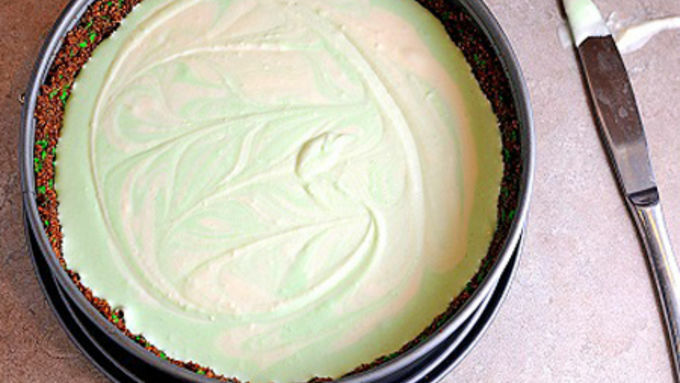 For the cheesecake: In a large bowl, combine the crème de menthe and gelatin; let stand for 2 minutes. Bring 1/2 cup cream to a simmer in a small saucepan. 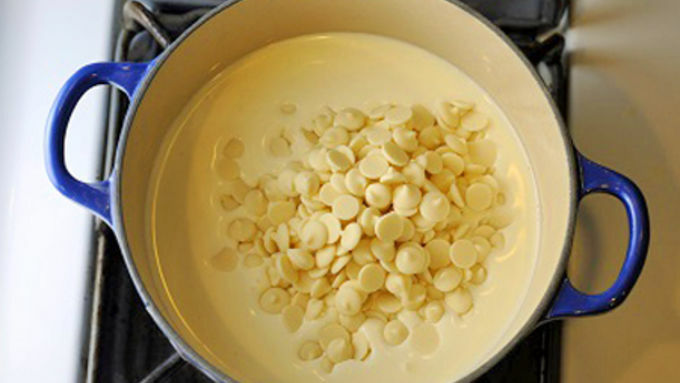 Remove from heat, and add white chocolate, stirring until smooth. Stir in the gelatin mixture, and allow to cool. In a large bowl (or use a stand mixer), beat cream cheese and 1 c. sugar at medium speed with an electric mixer until combined. Slowly beat cooled white chocolate mixture into the cream cheese mixture. In a large bowl, beat remaining cups cream at high speed with an electric mixer until soft peaks form. Fold into white chocolate mixture. Divide the batter in half. 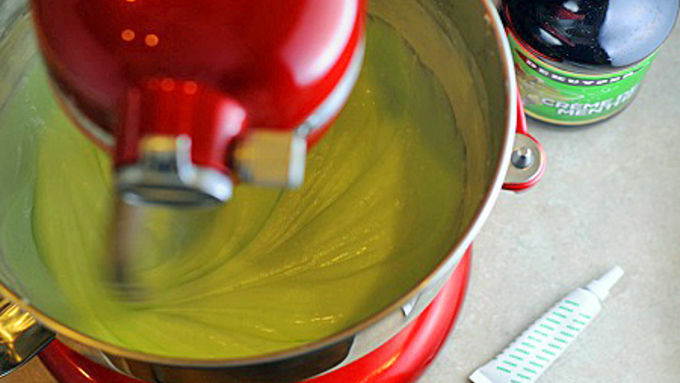 Add a few drops of green food coloring to the one batter and stir until fully incorporated. Pour a layer of white (1/2 the white batter). Put in freezer for 5 minutes. Remove and add 1/2 green and the remaining white on top of it and swirl with knife to create swirl effect. Freeze for 5 minutes. Then add the last bit of green batter on top. Spread with a spatula to make smooth. Cover and freeze over night. Decorate with whipped cream (I spiked mine with more crème de menthe) and extra sprinkles if you desire. Remove from freezer and gently run a knife around the edges of the pan to release the crust from the side of the pan. Cut into wedges with a knife that has been dipped into hot water. What to do on St. Patrick's Day? I’m pretty sure if you ask anyone what you are supposed to do on St. Patrick’s Day, everyone will say… call your mom and tell her you love her (you should do that every day)… no silly, they will say DRINK! And while green beer may be fun to look at, it doesn’t taste all that good to me. However, I do love shamrock shakes that are spiked with Crème de Mente. 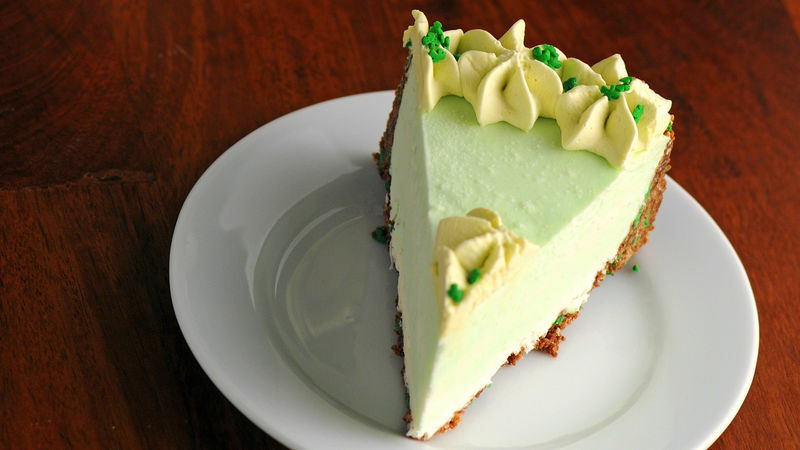 Then bam it hit me… make a dessert to honor shamrock shakes. 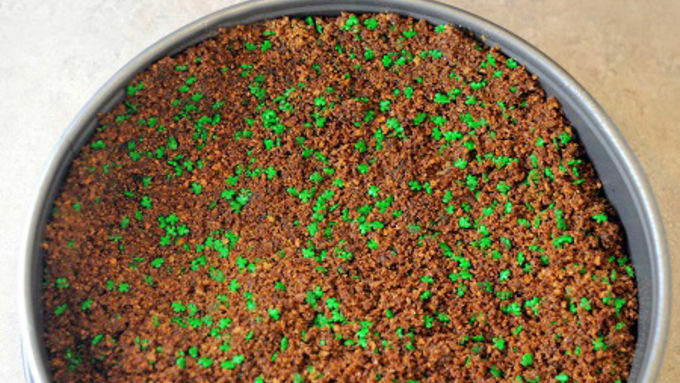 This Boozy Shamrock No Bake Cheesecake idea came from a version (strawberry) I made on my own blog for my fiancés birthday. It was such a hit I decided to do a version for St. Patty’s Day. This one was just as much of a hit. I was lazy and didn’t check the craft stores to see if they had shamrock sprinkles, I’m guessing they do, but I just found some on line and ordered. While it does have to set up overnight, that just makes it the perfect make ahead dessert especially because it is no bake! So make this for the love of your life and hey… you might just get lucky.